That was my working title for the article you are about to read. It was how I referred to the article when talking with my friends. In 1978, I was an undergraduate student in the Independent Study program at Southeastern Mass University in North Dartmouth, Mass. My major was Communications with a minor in Education. I had successfully petitioned the school to let me take on a two year, 12 credit project creating a media presentation on Mahatma Gandhi. Two semesters would be spent on research and another two semesters would be devoted to the writing and creation of the program. During my research phase I wrote an article in a Hindi newspaper telling people of my project. I asked for any help in the way of insights or anecdotes people might be willing to share. The response was overwhelming. One day I came home from school to find 128 pieces of mail waiting for me! Over the next weeks I received books, tapes, photographs, and stories from Indians at home and abroad. One letter I received was from a professor from the University of Bombay. He said that India's Prime Minister, Morarji Desai, was scheduled to visit the U.S. in June. He pointed out that Prime Minister Desai had known Gandhi personally. He suggested that I write the Ambassador of India and request a meeting with the Prime Minister to gather research. Yeah, right. The leader of 15% of the world's population will simply jump at the chance to meet ME. I shrugged off the idea as absurd. When I happened to mention the letter to my older brother, Bob, he said, "So write him and ask! So what if he says no? At least you would have tried." Skeptically, I wrote the Ambassador of India and explained my project and my desire to meet with the Prime Minister of India. Weeks later I received his reply. 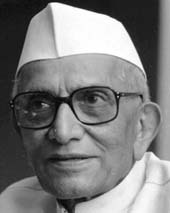 Prime Minister Desai would be in Washington, D.C. with President Carter for two days and in New York for two days addressing the U.N. The bottom line was that the Ambassador would forward my request to the Prime Minister but I shouldn't hold my breath. The Prime Minister's dance card was pretty much filled. Then, about a month later, an amazing thing happened. I got another letter from the Ambassador's office. It essentially said that the Prime Minister was interested in my project and would like to know more details. What motivated my interest in Mahatma Gandhi? What are my views of Gandhi? What do I see as the overall message of my project? After pacing frantically around my apartment, I sat down and wrote my heart out. After a few days my reply was on its way. Then things got interesting. I received a letter from the Ambassador's office telling me that I could have seven minutes with the Prime Minister in Washington, D.C. I wrote back explaining that as a college student with as many part-time jobs as classes (I didn't mention that all I drove was a motorcycle) I couldn't afford to get to Washington. I had requested to meet the Prime Minister when he was in New York City. I could get to New York. On June 10th I received a phonecall from the Ambassador's office. Be at the United Nations Plaza Hotel at 7:45 tomorrow morning, June 11th. I would have, not seven, but three minutes to interview the Prime Minister. I immediately called Richard St. Aubin, a photographer who worked at the school. Richard had lived in New York City for many years and had friends there that we could stay with. He would photograph the interview and was willing to make the five hour drive to New York City on a moment's notice. Richard picked me up two hours later and off we went. When I returned from the trip, many friends encouraged me to write an article about the experience for the school and local newspapers. I wrote a short article and sent it to The Standard Times, our local paper. The editor, James Ragsdale, called and suggested we meet at his office. He asked me to tell him about my experience meeting Prime Minister Desai. I went on and on about the experience and had him laughing and clearly moved at times. Then he showed me his copy of the meager article I had submitted and asked, "Why isn't that story in here?" He said I had written my impression of a newspaper article. He suggested I go home and write the story I had just told him. That was the story he wanted to publish. So that is the story I wrote during the summer of 1978. I hope that you enjoy it. “The Prime Minister will see you now,” said the aide. I left my seat so mechanically I almost forgot Richard was with me. When I reached the door of the suite an agent, C.I.A. perhaps, stepped in front of me. “Hold it!” he said. "Open that up!" He pointed to the cassette compartment of my tape recorder. “BWOOOOOOOOP!” Feedback echoed through the hall. My heart pounded. I had pushed the wrong button. When I finally managed to turn it off I felt like an idiot. The agent examined the tiny cassette compartment with a chrome penlight and let me pass. Underneath the bulky recorder was a utility compartment big enough to store lunch for two but, I guess he didn’t notice. He checked Richard’s cameras with a thoroughness that was, at least, consistent. Desai eats two meals a day consisting simply of cheese, fruit and milk. When he wakes at 4:00 each morning he meditatively spins cloth, a practice made popular by Mahatma Gandhi during India’s struggle for independence from Britain. His close association with Mahatma Gandhi was what I was interested in. Desai’s opinions could enhance my research. It seemed farfetched that the Prime Minister of India would agree to meet with a twenty-four-year-old undergraduate student to talk about Gandhian philosophy but there I was. Only a week ago the date was set for June 12th. Only yesterday I was told to be at the United Nations Plaza Hotel, N.Y. at 7:45 a.m. I wondered now if one hour of sleep, a cup of coffee, and half pack of cigarettes had been enough to get me through this. When we arrived at the 28th floor of the hotel, we met our first Consulate Aide. He was a short, middle-aged East Indian with black-framed glasses and a slightly limp turban. He rushed about like a housewife trying to coordinate a dinner for thirty. When the last of the reporters had cleared the doorway, I entered the suite. Dozens of thick electrical and video cables covered the floor between me and the Prime Minister, who could be seen in an adjoining room. Another aide came from behind and with a wide circling motion of his arm gestured for me to cross the less-scattered cables to my left. As I did, a television cameraman began blindly gathering the cables with such speed that they squirmed and slithered around my feet like snakes. I was relieved the Prime Minister hadn’t seen me as I hopped across the room. I recall only pieces of the conversation that followed but we talked about Gandhi some more and about great men in general. I mentioned Buddha and he mentioned Thoreau. (He felt sorry Thoreau didn’t receive the recognition he deserved during his lifetime.) He asked about the books I had read was interested in my research. Between the twenty-five minutes of taped conversation and our conversation afterwards, we had spent, not three, but forty minutes together. Nevertheless my mind filled with questions I wished I had asked. 1. The reporters and news anchors who were leaving the Prime Minister’s suite as I was going in included John Chancellor, Barbara Walters, Peter Jennings and Dan Rather. Other faces were familiar but we couldn’t put faces to names at the time. They all had come to ask Desai how India would vote regarding Nuclear Arms proliferation. Ironically, not only were they all scooted out when their time was up, he refused to reveal to them how India would vote whereas he explained his vote to me in detail. 3. 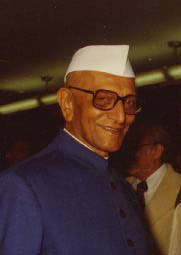 Desai is credited for having healed relations between India and Pakistan. He did away with many of Indira Gandhi’s constitutional amendments which had stripped the rights of citizens and he made amendments which prevented any future government from misusing National Emergency. The Janata Party, however, was unstable and began to divide, hampering Desai’s effectiveness. Desai was too conservative for many. One journalist accused him of having secret dealings with the C.I.A.. This was never proven and Desai denied it to his death but it damaged his reputation. He resigned from office and from politics in 1979. 4. In the first draft of my article (the brief one) I left out Desai’s comment about the Jews under Hitler. James Ragsdale, the newspaper editor asked me why. I told him I left it out because I didn’t want to hurt or offend anyone. He pointed out that it was not my job to edit or censor the Prime Minister of India. My job was to report the experience. Give the reader the information and let them draw their own conclusions. Quite a teacher, that Mr. Ragsdale. 5. The most memorable aspect of Morarji Desai, which I under-appreciated at age 24, was his aura of serenity and kindness. By the beginning of our talk, I was very nervous. I was way over my head in this situation. When I looked at Desai, his entire demeanor somehow communicated that everything was fine… there was nothing to be nervous about. Nearly thirty years later, that aura is what I remember best about meeting Morarji Desai. 6. On April 10, 1995, Morarji Desai died at the age of 99.